"This post was sponsored by Vine Vera through their partnership with Shopping links. While I was compensated to write a post about Vine Vera, all opinions are my own." Probably my favorite of the collection thus far that I use daily morning and night. This cream will help reduce the appearance of dark circles and fatigue under the eyes. It is formulated with Resveratrol Ferment extract, Caffeine and Vitamins A (Retinyl Palmitate) and E (Tocopheryl Acetate) derivatives to awaken and refresh the delicate skin under the eyes. I've added this to my evening skincare routine. This light and smooth eye serum is designed to reduce the appearance of fine lines and wrinkles surrounding the eye area. Rich, yet non-greasy, this eye serum was formulated with Resveratrol Ferment extract, green tea extract (Camellia Sinensis Leaf Extract) and vitamin C (Ascorbic Acid) derivative to help reduce the signs of aging. Got to love a good eye firming cream that helps with puffiness. I use this in the morning daily to fight the puffiness. The Resveratrol Cabernet High-Potency Contour Eye Firming is formulated to enrich your skin, leaving it looking soft, plump and firm. The combination of ingredients and vitamins such as Resveratrol (Pichia/ Resveratrol Ferment Extract), Vitamin E and Vitamin A will help improve skin tone and skin texture as well as reduce signs of fatigue and aging around eye area. Caffeine is also included in the formula to help with reducing puffiness and dark circles. This product is magic on your skin that helps improve skin tone and texture leaving your skin rejuvenated, smooth and radiant. The revolutionary Resveratrol Cabernet High-Potency Eye Serum is the ideal complement to your daily eye care routine. The combination of the 3 main ingredients, Resveratrol ( Pichia/ Resveratrol Ferment Extract), Palmitoyl Oligopeptide and Vitamin C (Ascorbic Acid), will help reduce the visibility of wrinkles and fine lines. Vine Vera is a prestige global skin care brand that serves men and women around the world with their anti aging needs and skin care concerns. They help customers make lasting improvements to the way they feel about their skin and present a wide range of skin care products that suit individuals with all types of skin. 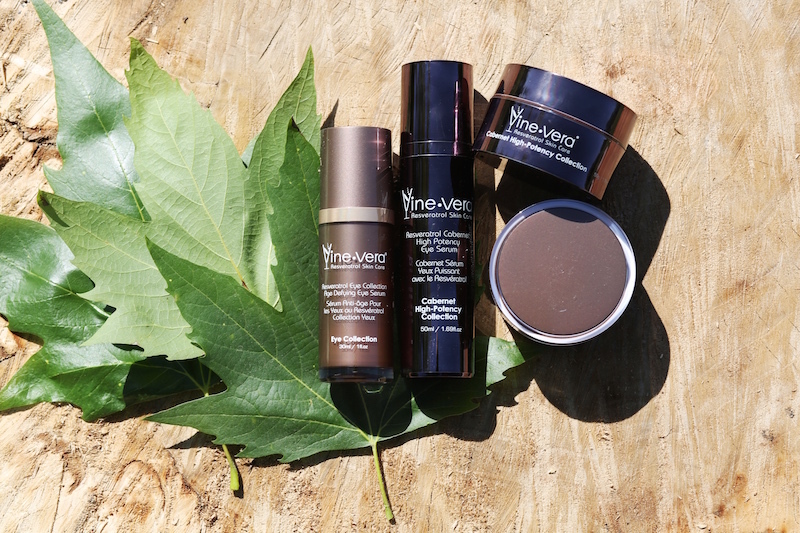 I hope I've inspired you all to check out Vine Vera's wine inspired collection that features Resveratrol as the key ingredient to help you with your skin concerns.